NEVER FEAR... lactose intolerance, allergies, faith-based fasting and dietary choice DO NOT have to get in the way of you enjoying those seasonal treats anymore! These completely vegan-friendly, light and aromatic hot cross buns taste like the "real deal" you'd purchase at your local bakery. The advantage of baking from home means that you know EXACTLY what goes into your food. The "nasty-free" addition of BioButtery® is no exception to this, helping you achieve the same velvety texture associated with its dairy-based alternatives. Hop into the kitchen and get going! Happy Easter! 1. In a small bowl combine 2 tablespoons of the brown sugar, yeast and soy milk. Set aside for 5 minutes to activate the yeast. The mixture will appear frothy. 2. Add the melted BioButtery® and mix whisk until well combined. Set aside. 3. In a larger bowl, combine the almond meal, spelt flour, cinnamon, mixed spice, salt, the remaining 2 tablespoons of brown sugar and assorted dried fruits. Stir until well combined. 4. Create a well in the centre of the dry ingredients and pour the yeast and soy milk mixture. Stir until a sticky mixture is formed. 5. On a lightly floured surface, knead the dough for about 5 minutes or until it is no longer sticky - this may require the addition of some extra spelt flour. Roll the dough into a ball. 6. 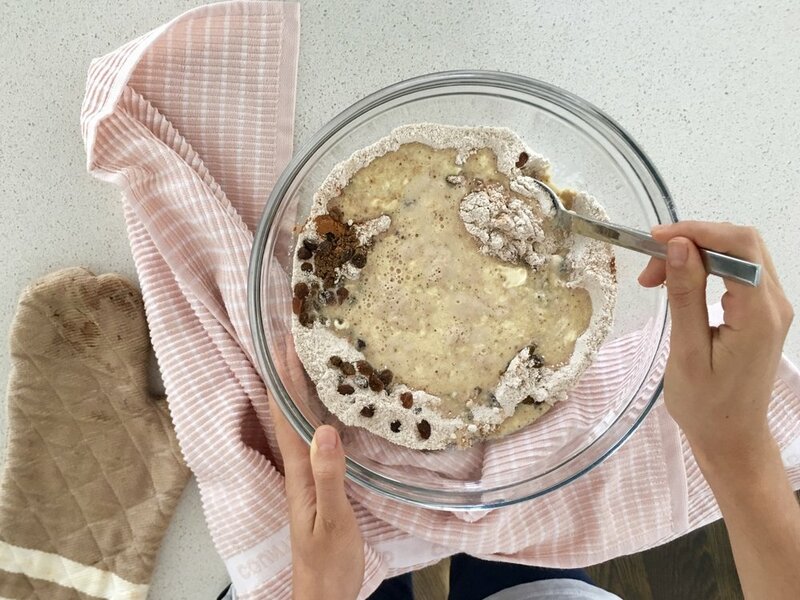 Place the dough ball in a lightly greased bowl (using BioButtery®) before covering with plastic cling-wrap and setting aside in a warm place for 1 hour. 7. Once the dough has doubled in size, punch the air out with your first and need for a couple more minutes on a non-floured surface until elastic and smooth. 8. Divide the dough into 8 equal portions and roll into small balls. 9. Place the balls in a lightly greased baking tin, cover, and allow to rise in a warm area for another 20 minutes. The balls should be placed right next to each other. 10. Preheat your oven to 190 degrees. 11. Combine the ingredients for the cross mixture before dispensing into a small piping bag (or freezer bag with the corner snipped). Pipe the crosses across the surface of the dough balls once they have risen again (approx. 1cm in height). 12. 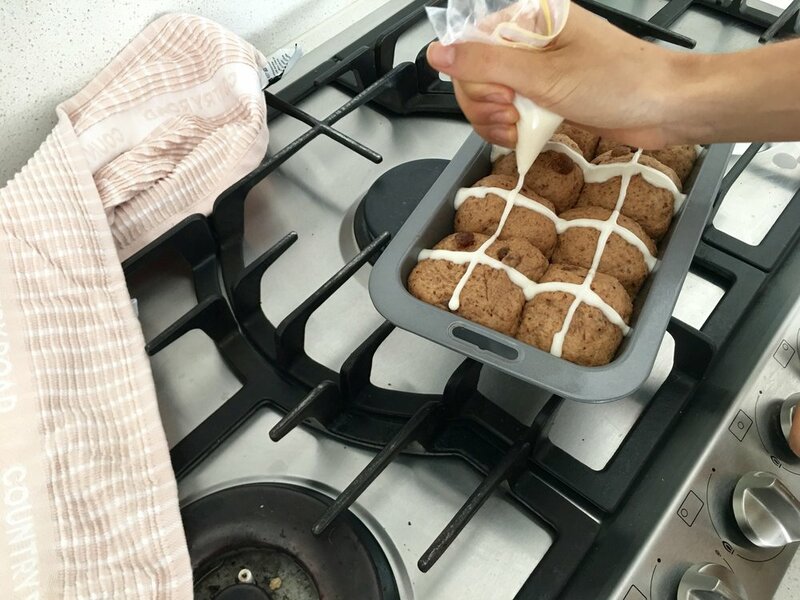 Bake the hot-cross buns for 25 minutes or until the tops are hard. 13. Immediately brush with apricot jam once removed from the oven and allow to cool for around 5 minutes or until the jam has hardened. Serve immediately with BioButtery®! Enjoy. Theres no room for NASTIES in your tummy!